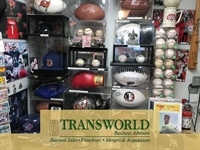 30+ year established collectible shop located in South Pinellas Beach. Located in a HIGH tourist and they specialize in autographs, memorabilia, sports, entertainment, movies, etc. This shop is full of unique memorabilia! Over $500k in wholesale inventory included in the price. Please refer to listing #3353694166 and ask for Dave Decamella when inquiring. Thank You!